link to photo galleries from events, & more! 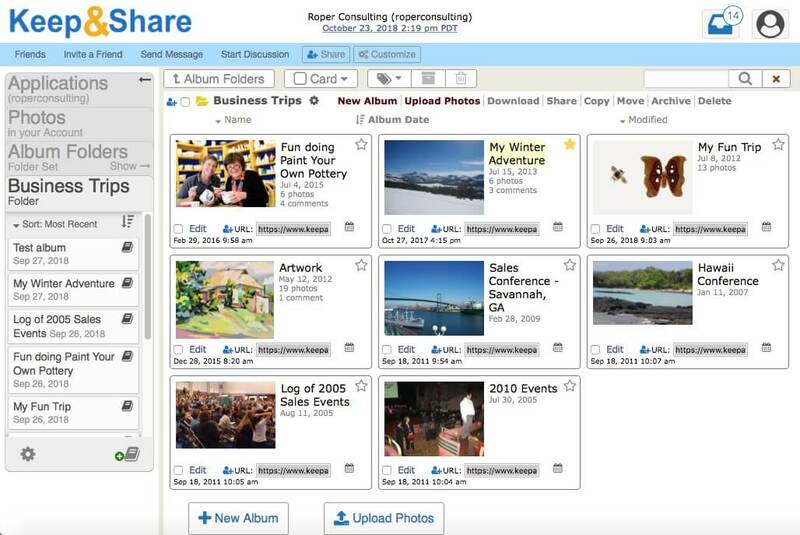 Your photos (just like everything in Keep&Share) are easily integrated with your calendar. Any photo uploaded to your photo library can be inserted into your calendar as a custom event icon or as an accompanying image in your event notes. You can also choose what size you want your images to be. 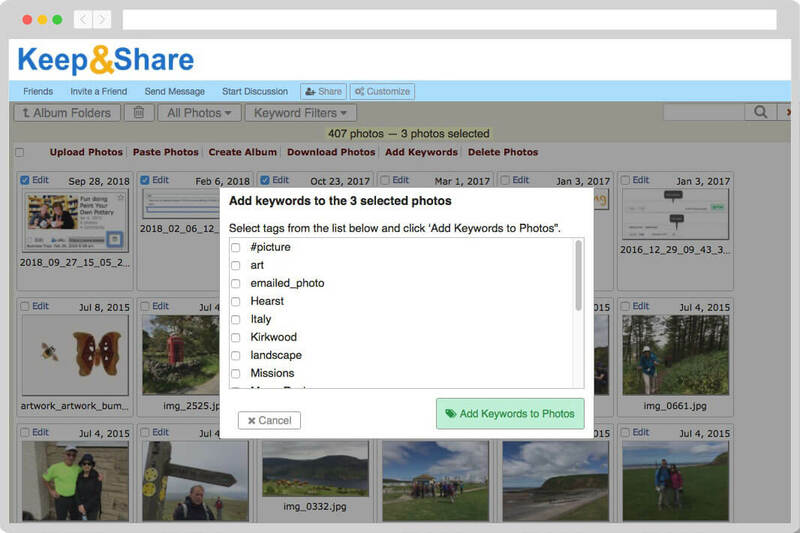 Privately share dozens or even thousands of photos in well organized collections that physically distant teams can review & comment on. Share out a public link or require people to log in to get permission. You can even give specific people edit rights. Because you can access, upload, & download photos from any internet-enabled device (even smartphones), it’s easy to add photos to your account wherever you are. Anyone with viewing rights sees them appear instantly in their account — even if they’re 100s of miles away. Your Keep&Share account can be the one-stop-shop for all your staff and clients. People can email photos to your unique K&S photo email address to add them to your account. 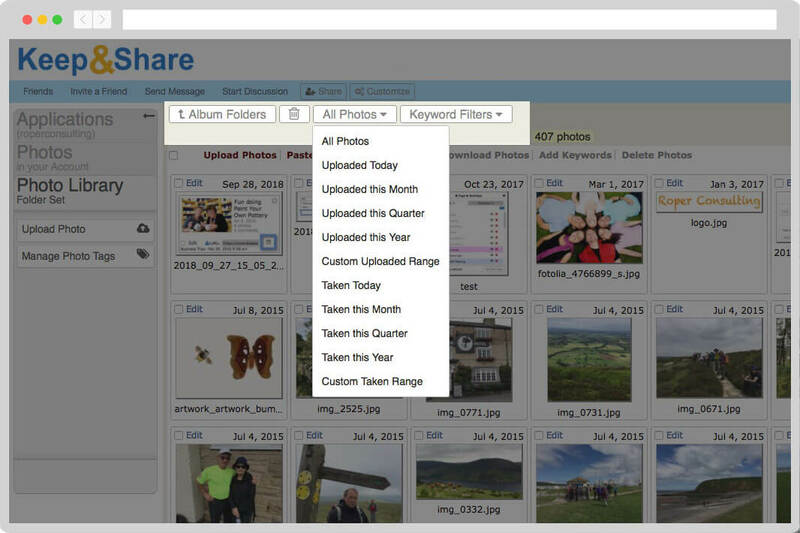 Then, organize photos into groups for specific clients or teams — everyone gets the same link but only sees their photos. 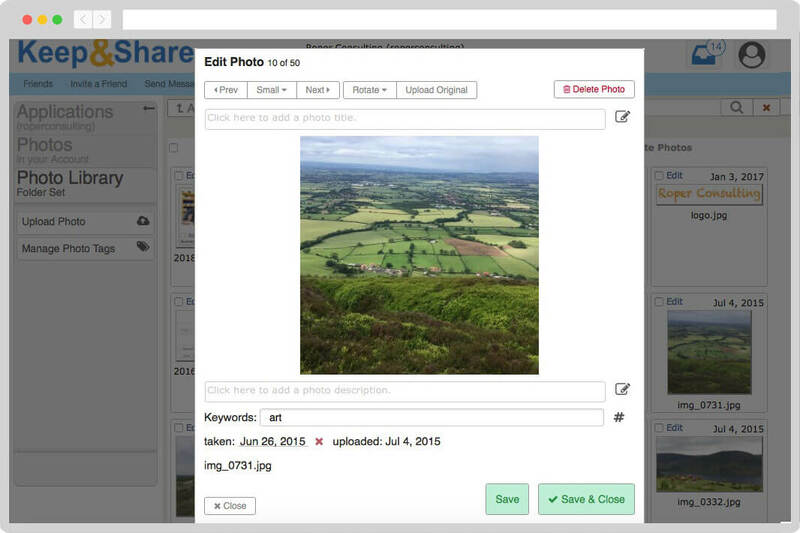 Upload your pictures via email or from inside your account, and then quickly arrange them, add captions, or tag people inside your own digital photo albums. You can keep the album private or share it later. 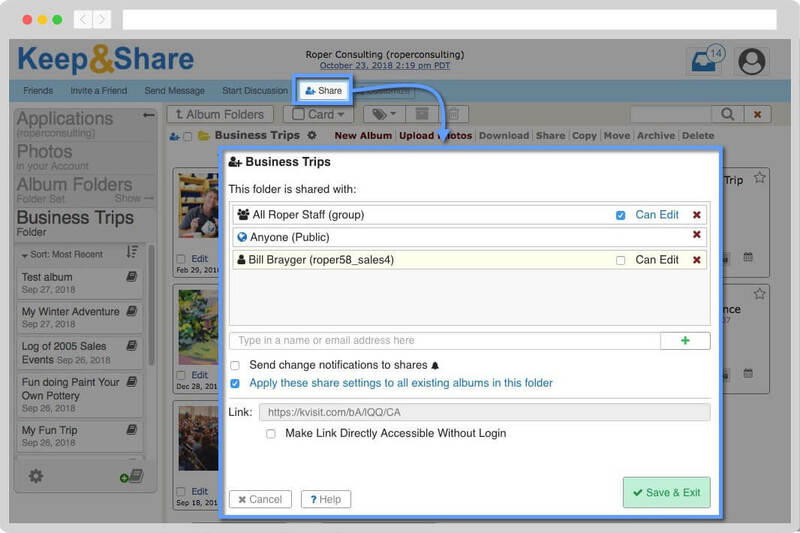 Add pictures without even logging in — photos appear in your account instantly when you or your staff email pics to your personal Keep&Share photo email address! 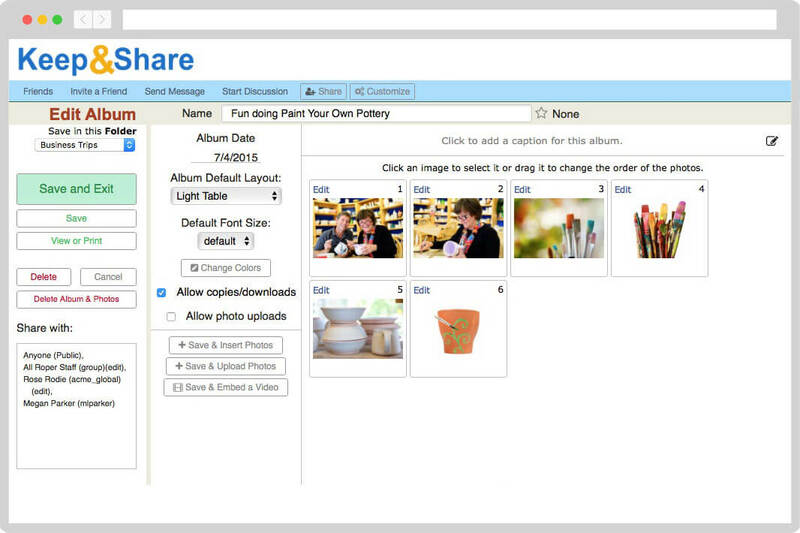 Or, log in and use the bulk photo uploader. 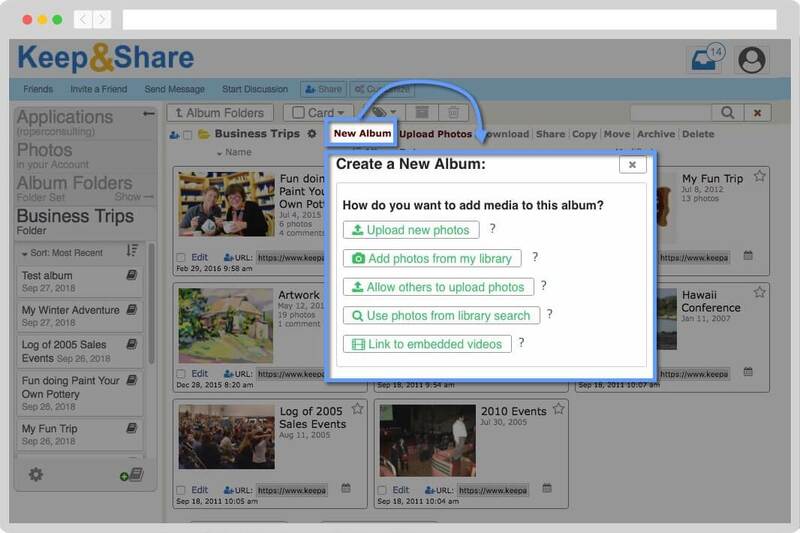 Create & customize your photo galleries and albums in Keep&Share, and just add the embed code to your website, or a link in an email! You get personalized web images, without needing expert web design skills. View, upload, and download photos from your iPhone, Android phone, iPad or tablet! You don’t have to remember to sync pictures to your device. You can access your Photos app on any computer, smartphone, or tablet, so it’s easy to add or view photos even when you’re out-of-the-office. Your photos (and everything else in your K&S account) are private by default — they can only be shared with others if you share them yourself. Easily limit who can see photos, and who can edit them, on a person-by-person basis. 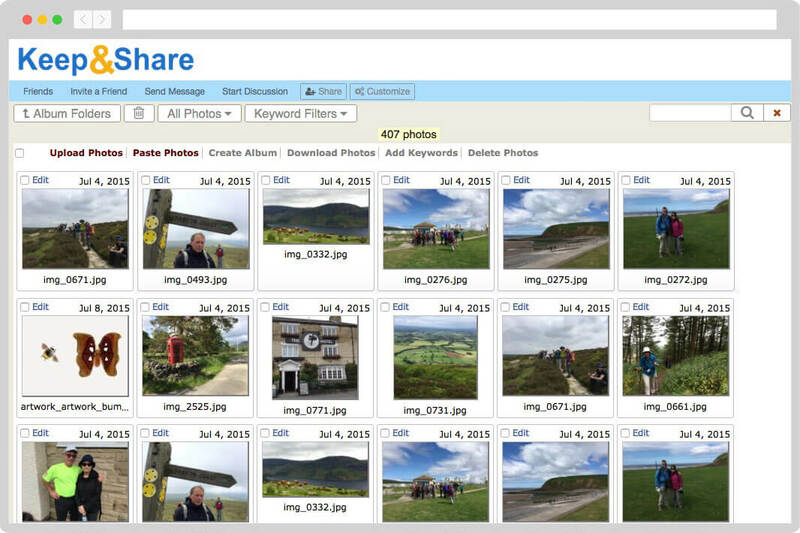 Solo and Team plans are https-encrypted and let you download your photos as a back-up. 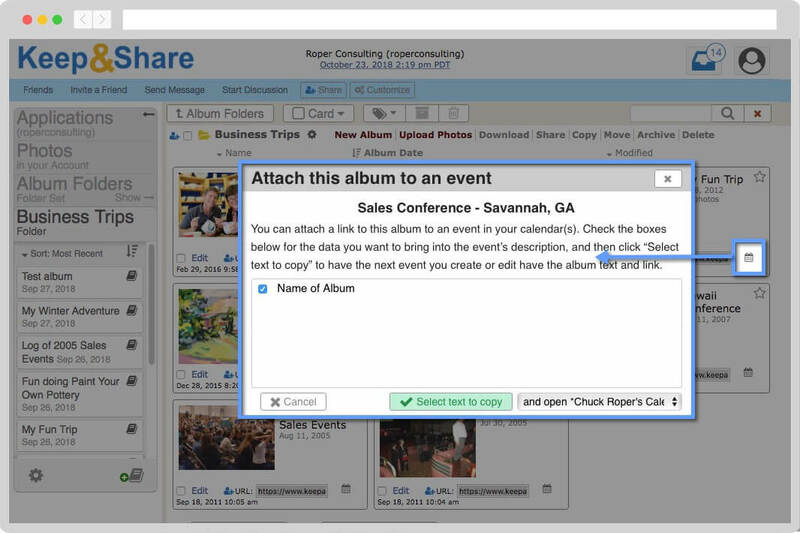 The 'Attach to Event' button is a quickly and easy way to add photos and photo albums to your Events without cluttering up the appearance of your events. You can also attach albums and photos to tasks in To Do Lists.